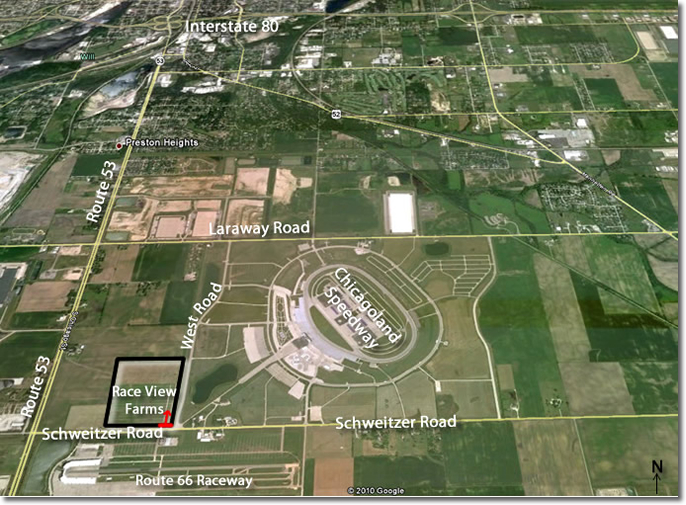 Race View Farms RV Camping next to Chicagoland Speedway and Route 66 – RV CAMPING- 2,000 Feet to your Seat! RV CAMPING- 2,000 Feet to your Seat! We are located next to the Chicagoland Speedway and offer RV camping and day parking for NASCAR, NHRA , and CONCERT weekends. We have plenty of spots available. The speedway is our next door neighbor to the east and the drag strip is across Schweitzer road to our south. Our entrance is on the north side of Schweitzer Rd. Welcome to the 2019 season at Race View Farms. We are now open for camping reservations for 2019 for 2 events. The first event is at the Rt. 66 Drag strip Nationals May 30th through June 3rd. The second event is NASCAR @ Chicagoland Speedway: June 26th through July 1st. We NO LONGER have a fax number so ALL reservations will need to either be completed online, snail mailed or you can scan a form and email it to us. Your charge notice or cancelled check will be your receipt. Please note we do not send a notification when we receive your reservation. We are now zoned for TENT camping. Please make sure we have your correct email address. You can email changes or additions to us at:mcdonalds@raceviewfarms.com. We no longer mail out the reservation packets via snail mail. All the information along with the reservation form is posted on the web site. You can print it from our site and mail it to our Post Office box, fax it in or you can use our secure online reservation system.